Taking methadone during addiction treatment requires knowledge of the drug and the safest ways in which to use it so that you will not experience any issues with the medication and its effects. This is why it is important for you to know the best way to take methadone in addiction treatment. When you decide that you want to receive methadone maintenance treatment, make sure you choose the facility that best fits your needs. Whether you are looking for long-term, live-in treatment within a controlled environment or a clinic you can visit once a day, make sure the facility has all the tools to fit your personal requirements so that you can feel comfortable there and will want to continue attending treatment. It is important not to take more than recommended dosage of methadone. Your doctor will give you a specific dosage for a reason. 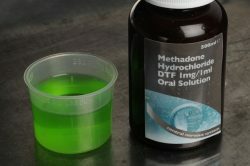 According to the CDC, “Most patients require a dose of 60-120 mg/day to achieve optimum therapeutic effects of methadone.” If you believe you need a higher or lower dose of the drug than the one you are currently prescribed to take, discuss it with your doctor before you make any changes to your routine. Some individuals believe every patient should take the same amount of methadone. However, “compelling evidence that doses need to be determined on an individual basis” has been found, and it is important that you and your doctor decide on an optimal amount that is specific to you. Be honest about how the medication makes you feel and whether you may need more or less depending on your own reaction to the drug. Even if you are attending treatment at an outpatient clinic, it is important to visit the clinic every day in order to take your medication there, especially in the beginning. Those who take their medication home sometimes put themselves at risk for abuse, and many clinics actually require patients to take their medication at the facility for at least the first few months. Your doctor will want to incorporate other treatments into your personalized program, such as behavioral therapy, group therapy, resocialization, vocational counseling, nutritional classes, etc. Make sure that you take these other treatments just as seriously as you do your medication. After all, “because they work on different aspects of addiction, combinations of behavioral therapies and medications… appear to be more effective than either approach when used alone” (NIDA).